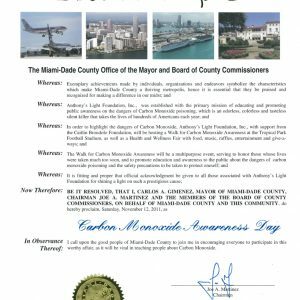 Anthony’s Light Foundation, Inc. is an educational 501(c)(3) Non-Profit organization established after the tragic loss of Anthony J. Perez, a highly valued member of the FIU community, as a result of accidental carbon monoxide poisoning. 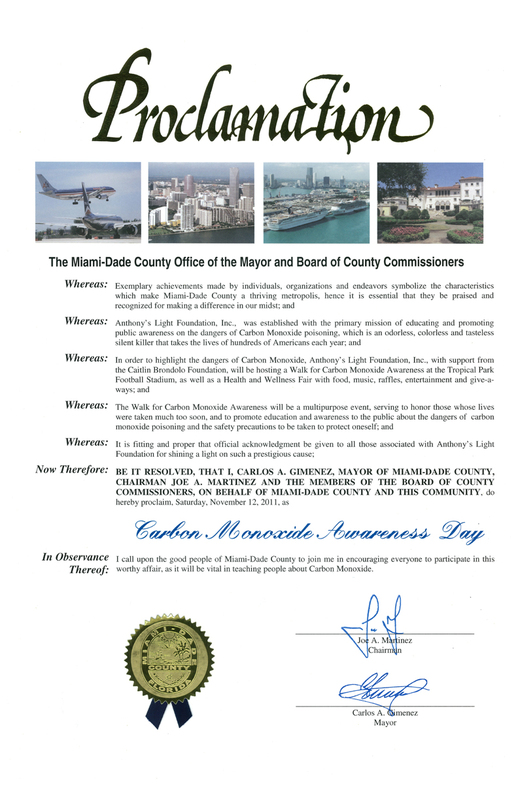 Anthony’s Light was founded on the primary mission of educating and promoting public awareness of the dangers of carbon monoxide poisoning, which will ultimately save lives. As a result of this foundation, Anthony’s Light has provided, through several outreach events, numerous carbon monoxide detectors free to the public, given countless educational speeches and presentations, and granted scholarships to high school seniors and University students in an effort to advocate continuing education. We believe that if we can save one life, we have made a difference! Anthony’s Light offers internship opportunities and awards community service hours. The organization unites with other non-profits to create a greater impact in the general message of SAFETY overall. We welcome you as an exhibitor to our annual 5K Walk/Run in November. Also, when in the area of State Road (40th Street and the Turnpike), know that you are travelling down Anthony J. Perez Way. We invite you to support the Cause and to join us in spreading the word! Let’s Say NO! to CO! once and for all.